Speed up Windows computer and improve system performance especially for the old computers with poor configuration. 1. Automatically adjustment and give higher priority to the process in need by analyzing the system performance intelligently. 2. Dataownerclub Windows Speed Up is small in file size, which will hardly consume the system resources. The acceleration effect is remarkable especially for the old computers with poor configuration. According to the actual measurement, the system speed can be increased by more than 30 %! 3. As long as you start this Windows Speed Up software, it will automatically speed up the system without configuration or human intervention. Older PCs with older version of Windows are prone to slowing down, and running into crashes and errors. This could be due to hardware issue, but in most cases the issue is within the Windows itself. There are many third party application available nowadays, that can help you optimize and speed up your PCs and give them a speed and performance boost. Different applications take different approaches to solve this problem, but not all the approaches work well. 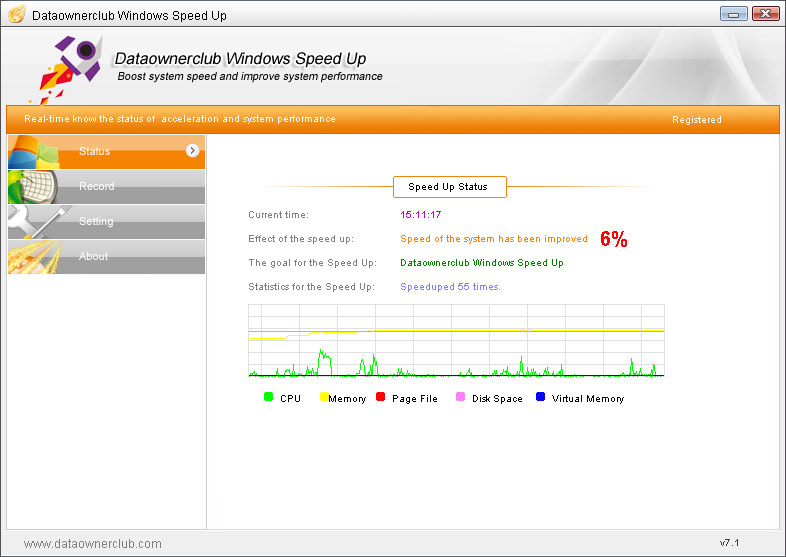 Dataownerclub Windows Speed Up is simple and lightweight application, that can help improve your PCs performance. It allows you to optimize your system, with suitable configuration settings, to control RAM, CPU, Disk, and page file usage. The installer size is ~421KB and the installation process is simple and straightforward, taking no time at all to complete. The application takes around 5Mb space on the drive once installed. After launching the application for the first time, you can easily activate and register the application using the registration code. Once done, you can start using the application and tweak around its settings. The application comes with a clean, simple UI with modern design and colors. There are 4 tabs on the side, namely Status, Record, Setting, and About. The first tab shows you the current time, shows percentage improvement, shows the statistics of speed up times. There is also a real-time graph that shows CPU, Memory, Pagefile, Disk, and Virtual memory usage. Each line has different color. Record tab shows record of the applications performance, whereas, the settings tab lets you tweak settings of the application. The last tab shows the link to developer site, and also tells you about the application and what it does. You don’t have to do anything in the app for it to improve your system’s performance since there are no buttons to push. The application runs in the background, and provides feedback on how its improving your system performance. – Simple yet informative UI, that looks and feels good. – Automatically adjusts and gives higher priority to the process in need by analyzing the system performance intelligently. – Lightweight, does not take much space on the hard drive or the RAM when running. – It automatically speeds up the system without configurations and the need to keep it under observation. – Two Speed up Levels to choose from, 10%-20% and 20%-30%. – Supported Windows version Microsoft Windows XP (32-Bit or 64-bit), Microsoft Windows 10 (32-Bit or 64-bit), Microsoft Windows 8/8.1 (32-Bit or 64-bit), Microsoft Windows 7 with Service Pack 1 (32-Bit or 64-bit), Microsoft Windows Vista with Service Pack 2 (32-Bit or 64-bit). – Works well for older PCs, not much useful for newer PCs. Only showed me about 3% impovement on my PC. Dataownerclub Windows Speed Up is a simple application to improve PC performance, suitable for users who do not want to press buttons, tweak settings and configurations. The application runs smoothly, without any lag or crashes. It is definitely recommended. Before downloading, checked their web site and am NOT impressed. What does it change in my system? Very little information provided so I would rate this a dangerous for ANY experienced user. That makes it even MORE dangerous for an inexperienced user. I would want to know what it changes, and whether everything is correctly reset the way it was if I turn it off or uninstall it. If it restores things, what happens to any system changes or Windows Updates made since it was installed or turned on? What happens if computer locks up or power fails, will this know to reset everything on the next powerup? Or would a reboot wipe out whatever it does safely until the next time it runs? Sorry for all the questions but these answers should be available somewhere.